Below is the article in its entirety, with asides and footnotes in square brackets by me. 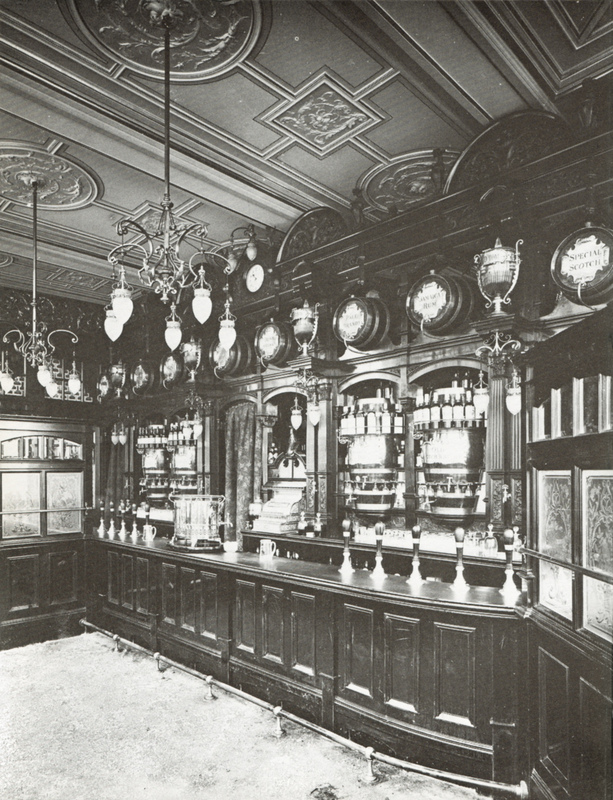 The picture above is of the public bar of the Dover Castle, 172 Westminster Bridge Road, Lambeth, taken the year after it was rebuilt in 1895, and just the sort of bar being talked about: note the sawdust, the brass footrail (seats were found only in the saloon bar) the ten handpumps (the saloon bar only had one), and the rows of casks on the back bar filled with spirits from Old Tom (sweet gin) to brandy. No pumpclips: these never started appearing until the 1950s. I believe this pub was destroyed in the Second World War, since the site is now occupied by a building of typical late-1940s neo-Georgian style, though it’s still a bar, called the Walrus. When “The Impenitent” has called on members of “The Trade” in London as long as I have he will have discovered that there is no such an article in Metropolitan Licensed Victuallerdom as “Half-and-half”. Were I Mr Lawson Walton, I should refer “The Impenitent” back to a study of moral philosophy, just as that gentleman recommended it its study to Mr Balfour recently. At any rate, the chapter on “How we Classify”, in Jevons’s eightpenny Science Primer on Logic, would come in handy. 2. Porter, called in London “Beer” and in the country unblushingly calling itself “Stout”. 3. Ale, otherwise known as “Four-ale”, “Cold Fourpenny”, “Mild”, “Mild Ale”, &c. In Bristol it is known as “Burton”, but in many large towns, eg Nottingham, no malt liquor is sold at so low a price as 4d per pot (quart). 6. Burton, strictly called “Old Ale” [sold for eight pence a pot]. Now we come to the combination of six articles taken two or more together. We now see how “The Impenitent” has tripped in regard to his “’arf-and-’arf”. A blend of all the above six articles should, properly speaking, be “Waste”, but there are ways and means of dealing with it, and treating it with egg-shells, and other finings, until it becomes again saleable as “Porter”! Don’t fight shy of porter at a Brewery Tap, or at one of the famous Boiled Beef houses, or at any place you can trust. And this blending of malt liquors, which is so dear to the Londoner, is said to have given rise to the now meaningless word “Entire”. In days gone by, possibly, “Entire Ales” gave a customer the flavour of a mixture though all drawn from one tap. The word now is a status of respectability, just as is “Member of Tattersall’s”, another phrase with a past [look that one up yourself]. Well a blend of one and two [ginger beer and porter] made “Portergaff”; one and three [ginger beer and mild ale] “Shandy” or “Shandygaff”; one and four [ginger beer and bitter], “Shandybitter”; two and four [the writer made an error and meant “two and three”, porter and ale] make “Four-half”. It is a drink not so popular as is generally supposed. It is sold for the most part “in your own jugs” at three-and-a-half pence per pot, though since the extra one shilling per barrel on beer in the present Budget [to help pay for the Second Boer War], a comparatively successful attempt has been made to get four pence per pot for four-half. Porter is a halfpenny a pot [quart] cheaper. Two [porter] is not often blended with four [bitter] or five [the writer had erred again, and meant “six”, Burton] but with six [he meant “five”, stout] it makes “Cooper”, a drink rather out of favour. Three and four blended make “Mild and Bitter”. Three [mild ale] and five [stout] are “Stout and Mild”; it is never called “Mild and Stout”; such a phrase would be barbarous. Three [mild ale] and six [Burton/Old ale] make “Old Six” [because it cost six pence a pot]; it might be called “Burton and Mild” but such a term is unusual. Four and five make “Stout and Bitter”, occasionally called “Mother-in-law”. Four and six are “Bitter and Burton”; if you said “Burton and Bitter”, you would probably be served with “Mild and Bitter”, and it would serve you right. The charge for Nos. 1, 2, or 3 is a penny per half-pint glass, a thick, almost unbreakable article, holding 5 per cent of froth at the top – a profit in itself – and the successor of the old-fashioned pewter throughout nearly the whole of London. Four, five or six cost twice as much. Blends at one and a half pence per half-pint are sold in a compartment known as a “Six-ale Bar”, or “Private Bar”, where there is a stool or two. In “Saloon Bars” nothing is under two pence per glass – there are a few houses where tankards are still obtainable, for the “boom in public-houses” is happily over and licensed victuallers have to think more about building up a business than they do of getting out of a business at an immediate thumping profit. There are numerous provincial variations of the various authorised terms. For instance, “Beer” at an officers’ mess means “Bitter” – probably the only sort of malt-liquor kept. But down at the Trent Bridge [cricket] Ground at Nottingham, “Beer” means “Ginger-beer”. Visitors to Nottingham should not fail to try “Botanic”, only don’t let them put too much gin in it. On the fringes of London there are numerous houses open for travellers during “prohibited hours”. These have made unto themselves a law that during these hours they sell nothing under sixpence a quart, and even during “opening hours’ they do not sell “Four-ale” by itself at fourpence a quart. They foist off “Four-Half” on the unwary. Of course, porter costs less per barrel than mild ale, so there is more profit by selling a quart of “Four-Half” for fourpence than there is in parting with a quart of “Four-Ale” for the same sum. “Burton” does not all come from Burton-on-Trent. It should really be called “Old Ale”. Some of the very best comes from Edinburgh. Yarmouth, too, sends a lot to London. Indeed, there is a large firm of brewers which does not allow anything coming from Burton to be sold in the houses that are tied to them for “Fine Ales and Black Malt”. This firm makes its own arrangements for supplying “Bitter” from places other than Burton. “Fine Ales” means “Four-Ale”. Water for brewing the very best “Pale-Ale”, ie “Bitter”, is the specialité of Burton-on-Trent. London water requires “Burtonising” before it is suitable, but there is good water for the purpose in the immediate suburbs, while at Maidstone, Bishop Stortford, Nottingham, and innumerable other places, there are wells of excellent water for “Pale-Ale” brewing. Burton water does not come from the River Trent, but from very deep and extremely valuable wells of very hard water. Any sort of water does for brewing anything but the best “Pale-Ale”. Home-brewed ale can still be obtained at Nottingham, but the big breweries are competing very hard against it. At Birmingham the big breweries have nearly knocked home-brewed out of the field. The “Nut-brown Ale that was famed for its strength throughout the village of Grand Pré” has its English equivalent at farmhouses in Suffolk. Trinity’s “Audit Ale” does not come in everybody’s way. But if you are a friend of the London managing director, and happen to be in the vicinity of Belvedere-road, Lambeth, just a little pint and a half jug all to oneself lets one know what “Old Ale” should be like. The distinction between the “public bar” and the “saloon bar” in a pub has now effectively vanished, but for readers from outside the British Isles, and those too young to remember, the “Saloon Bar” was the more upmarket room in a pub, where everything was slightly more expensive than in the Public Bar. The period from about 1890 to 1899 when breweries rushed to buy up surviving free houses for fear that they would be locked out of the beer market if their rivals captured all the previously untied pubs. From the first arrival of “bitter beer” in the late 1830s/early 1840s to the early 1960s, the pale hoppy brew was the middle-class/officer class drink of choice, while the ‘lower orders” drank, first porter, and then mild ale. This was the drink sold as “Scotch Ale” or “Edinburgh Ale”. My suspicion is that the firm referred to was Courage, in Horsleydown, hard by the south side of Tower Bridge, originally an “ale” brewer (that is, not a porter brewer, but a brewer of mild ale), which took pale ale supplies for its pubs from Flower’s in Stratford upon Avon and then Fremlin’s in Maidstone, Kent before finally buying a pale ale brewery itself in Alton, Hampshire. Nottingham still had around 110 own-brew pubs in 1900, part of a still-enormous tradition of home-brew inns and beerhouses across much of the Midlands. A reference to the Lion Brewery Co, another of London’s “ale” breweries, which stood on the South Bank where the Royal Festival Hall now is. It looks as if Old Ale was a speciality. Excellent! An almost 1970’s-style journalistic review of current beers except from 70 years before. Jackson and Boston would have loved it. Well done. It’s interesting how many mixtures there were and in differing proportions. A lost art, although one can, and I do, do it at home. Last night: Fuller’s porter and an American pumpkin beer 3:1 and then doused with Carlsberg lager to lighten the load. A lovely darkish tan drink with all the right elements in place, that night anyway. I met a gent recently who knew the beer scene in London in the early 60’s. He said that the lore was, mild ale was often compounded of leftovers but bitter never was (perhaps an echo of its superior status and of course it sold for more). He said oftentimes a pint of mild tasted of shandy, from previous pints sold… Best to make one’s mixtures at home, I say, but clearly in 1900 there was an art to it in the public bar. I assume the ginger beer was alcoholic rather than the flavoured fizzy pop we have these days? Boiled beef and porter certainly sounds like a fun thing to do one weekend. Goes to show that matching beer and food is really nothing new at all, we just forgot about it. Thank goodness the ‘putting it all back in the mild’ died out in the 1980s. Here in Stevenage I once had a pint of Greene King KK which tasted distinctly of cider. At another local (McMullens) pub there was a change of landlord about 30 years ago and the AK drinkers of the public bar complained that the beer was just not ‘the same’. It turned out that the slops from the Country Bitter &c were no longer being put back into the AK! That Daily Express article isn’t confusing at all. My heads a’ spinnin’. I’ve thought for a long time, even as a kid, that there is plenty of everyday commonplace life that we simply don’t catalog because we don’t realize how quickly it could suddenly disappear and be replaced with the newest thing. I guess that’s what Wikipedia’s for now… theoretically. there’s no mention of binge drinking anywhere! Funny. I made a real ginger beer (fermented with a special multi strain) and put it on tap at our brewpub recently. I knew it was a forgotten tradition, but i didn’t know it was common in pubs. So I think it’s no so weird to serve real draught Ginger beer and a X ale side by side? Nice! About boiled beef and carrots. I first visited England in the mid-1980’s. It made a huge impact on me, it was just before international branding and uniformity of car design took over. England seemed very different than life at home. The foods in pubs, non-ethnic restaurants and local markets often was still quite local – while on average the food eaten out is probably much better today, I suspect it is harder to find traditional English food in these outlets than then. I ate a custard dessert at the dog races in the East End, Hackney I think it was, and it was one of the best things I ever had. Boiled beef, as I had it, was a salt beef dish (not the sandwich of course). I think – I inquired – silverside was used. You saw all these strange names in the shops like silverside, gammon, nay, corner gammon. Hand of pork, etc. Someone told me that boiled beef and carrots was a specialty of London for Monday nights when the washing was done. I still enjoy the Capital, more than ever in fact, but there was a special flavour to those first visits, not least the beers. The beer scene is much more diverse today even in the cask beer area, but not necessarily better. On a recent trip, Old Hookey reminded me – gratefully – of many beers sampled on those early trips but today it’s not always easy to quickly find a beer of that quality in England or at least London. Sorry to be thick but what’s a “bar gun”? The thing they dispense soft drinks out of. I had to Google it. It’s the soda/water/sour mix/iced tea dispensing gun. It’s a hand held device that can dispense a number of different non-alcohilic beverages. I deliberately didn’t explain that to leave it as an example of something that everybody’s seen but nobody’s ever read about. What a handy article. I’m sure I’ll make use of it in the future. It’s interesting that the draught beers in London pubs were the same 40 years later: Porter, Mild, Bitter, Burton and Stout. One small point: I’m certain that pump clips appeared before WW II. There are adverts in 1930’s editions of Barclay Perkins Anchor magazine showing beer engines with clips. In one they’re for “Ale” and “Best Ale” and in another for “Bitter” and “Best Bitter”. I still have the dream of persuading someone to open an Edwardian-themed pub with an authentic range of beers. You’re right, of course, Ron, but while examples existed before the Second World War, they never became widespread until after it. The ginger beer bit is fascinating. Especially now that brewers like Williams Bros and Mordue are starting to make ginger-spiked beer to be sold on handpump. I think the excellent article confirms the fact how much the beer sold in pubs has changed over the past century. To give two examples in The Local (by far and away the best book on pubs) Maurice Gorham mentions beer styles such as Burton which was popular in London of the 1930s and which have now totally gone. And PG Wodehouse talks about various beer related drinks in several of his novels. The one I can remember immediately is beer with an egg in: try asking for this in your local Weatherspoon. I used to notice the bar gun but only as a result of working in pubs in Northern Ireland where, for some reason, the system weren’t offered. All “baby bottles” and “splits” of Coke/Club/Fanta/tonic/soda water instead. Or a 1.5l plastic bottle in the fridge.